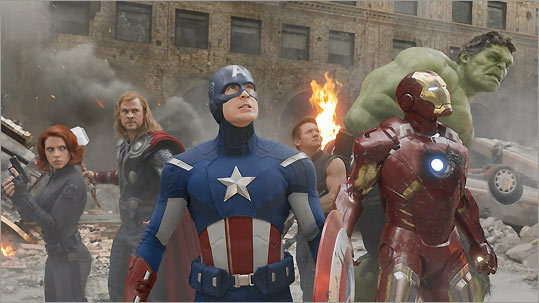 (Walt Disney Pictures) From left: Black Widow (Scarlett Johansson), Thor (Chris Hemsworth), Captain America (Chris Evans), Hawkeye (Jeremy Renner), Iron Man (Robert Downey Jr.), and Hulk (Mark Ruffalo) in the "Marvel's The Avengers," directed by Joss Whedon. The word “universe” is standard parlance in the comic book industry. The term is used to remind us that despite superheroes’ singular abilities, they are not alone in their fictional world — they cross paths, they form alliances, they fight. This is true of the Marvel Universe, which includes Spider-Man, Iron Man, and the X-Men, and the DC Universe, home to Superman, Batman, and Green Lantern. If there’s one thing that comics readers have always dug, it’s a team-up. You don’t hear “universe” much in the film industry. Here in the real world — or Hollywood, at any rate — the prospect of mingling franchise characters is dauntingly complicated. Sure, we get a novelty such as “Alien vs. Predator” here and there, but rarely. Different studios hold rights to characters. Actors’ contracts can be tricky to coordinate — and so can their egos, one imagines. A standard-length script can start to feel crowded with multiple headliners in the mix. All of which makes the superhero crossover vehicle “Marvel’s The Avengers” the unlikeliest event movie of the summer. Who’d have thought — the Marvel Universe, in all its colorful sprawl, making the jump from the comics page to multiplex screens? The road to the movie stretches back far beyond that. The first issue of “The Avengers,” created by the legendary Marvel writer-artist tandem of Stan Lee and Jack Kirby, was published half a century ago, in September 1963. In a “Marvel Masterworks” collection of those early stories, Lee recalled the impetus for throwing together Iron Man, Thor, the Hulk, Ant-Man, and the Wasp. (Cap and others would soon follow.) “One of the most popular features of our mags, according to the fan mail, were the guest appearances that our heroes [made] in our other titles,” he wrote. “Why not get a team where a number of them could join forces?” Another motivator, of course, was the success that rival DC Comics had already been enjoying for a couple of years with “Justice League of America,” which featured heavy hitters Superman, Batman, and Wonder Woman. Marvel Studios president Kevin Feige, a self-professed fanboy turned development exec, reportedly had a similar creative epiphany a few years ago. Back in the ’80s and early ’90s, Marvel’s ill-advised Hollywood dealings had resulted in duds such as “Howard the Duck” and a Spider-Man rights mess that for years blocked a movie from being made at all. But by 2005, thanks to savvier moves by the company — and special effects artists’ increasing ability to render superheroics realistically — Feige and his colleagues found themselves in a position to try something as ambitious as Lee and Kirby had attempted. They realized that unlike Spider-Man and the X-Men, who were licensed to Sony and Fox, the core Avengers characters were all still Marvel’s to steer — in one big ship, if they chose. After floating an interest-gauging “Avengers” teaser at the end of 2008’s “Iron Man” (see story, Page N14), Feige and his team began building their cinematic collection franchise by franchise, one superhero at a time. When they hired Kenneth Branagh to direct “Thor” and Joe Johnston (”The Rocketeer”) to make “Captain America,” they made sure both filmmakers were open to the idea that they were playing in a shared sandbox, and would be receptive to tackling “Avengers” setup scenes. But for all the ingenuity Marvel may have displayed in clearing logistical hurdles to make “The Avengers” a reality, is the movie guaranteed to come across as a bright idea? Some observers have wondered what it will mean for Marvel’s already scheduled slate of sequels — next year’s “Iron Man 3” and “Thor 2,” as well as 2014’s “Captain America 2” — if “The Avengers” lands with a thud. Another consideration is the challenge that’s always involved in translating superhero iconography to the screen without having the characters seem foolish. Filmmakers such as Christopher Nolan (“The Dark Knight Rises,” scheduled for release July 20) have taken great pains to ground their genre entries, tempering the incredible with heavy doses of the credible. Marvel’s upcoming reboot “The Amazing Spider-Man” (July 3) is said to take a similar approach, darkening the tone established by Sam Raimi’s original trilogy. Can half a dozen heroes be thrown together in live action without demanding too great a suspension of disbelief, and playing like the epitome of “Superfriend”-ly silliness? The “X-Men” series has managed the trick. Still, that stock comics image comes to mind of heroes gathered around some conference table — in costume — talking crimebusting strategy. You picture it, and you wonder. Maybe that’s just where Whedon comes in. He’s hardly new to the superhero genre: In his spare time, he did a couple of years’ worth of award-winning writing on Marvel’s “Astonishing X-Men” comic, including a metaphorically provocative story line about a cure for mutancy. (The story was subsequently borrowed by the makers of 2006’s “X-Men: The Last Stand.”) He was also one of the writers who took a crack at the script for the first “X-Men” movie. And Whedon’s work on “Buffy” repeatedly established his flair for taking a ridiculous ensemble premise — high schoolers tangling with hell spawn — and legitimizing it with mature drama, smart wit, and skillfully staged action.